PT Perusahaan Listrik Negara (Persero) - PLN later known as "PT PLN (Persero)" is the national electricty power company of Indonesia wholly-owned by the Government of Indonesia. PT PLN (Persero) has a right to monopoly on electricity distribution in Indonesia. The Company operates primarily as an electricity power provider in Indonesia. Its business include generation, distribution, transmission and other electricity related services. Headquartered in Jakarta, PT PLN (Persero) now has 15 area offices, 6 distribution unit offices, 2 Distribution and Load Control Centers, 6 Generation units, 14 Parent Project Units and 6 Central and Services Units throughout Indonesia. The national electricity power company also supported by 11 key subsidiary companies. PT PLN (Persero) has shown another solid performance in 2014 with a significant growth in total net sales and net profit. 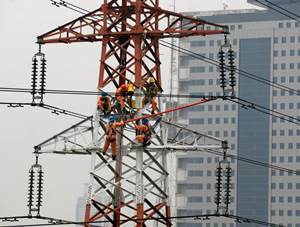 According to PT PLN (Persero) Annual Report 2014 as cited by JobsCDC.com, PT PLN (Persero) booked total net sales of Rp 198.60 trillion in 2014 or grew by 5.89% compared to Rp 187.54 trillion in 2013. Total net profit in 2014 amounted to Rp 11.7 trillion, compared with loss of Rp 26.2 trillion in 2013. Single/Unmarried and willing not to get married during the "Diklat Prajabatan" training program. Electro Engineering Power Lines (Code: S2 / ELE). Civil Engineering (Code: S2 / SIP). Geology (Code: S2 / GEO). Chemical Engineering (Code: S2 / KIM). Mechanical Engineering (Code: S2 / MES). Renewable Energy (Code: S2 / ENE). Instrumentation (Code: S2 / ITM). Informatics (Code: S2 / INF). Environment (Code: S2 / LIN). Project Management (Code: S2 / PRO). Marketing (Code: S2 / PSR). Electro Engineering, Power Lines, Electricity Engineering (Code: S1 / ELE). Electronics : Control - Not Telecommunication (Code: S1 / ALE). Industrial Engineering (Code: S1 / IND). Electronics : Control - Not Telecommunication (Code: D.III / ALE). Marketing Management, Commerce Administration, Business Administration, Office Administration (Code: D.III / MAN). S2 : Birth in 1988 and thereafter. S1 / D. IV: Birth in 1990 and thereafter. GPA ≥ 3.00 : S2/ELE, S2/SIP, S2/GEO, S2/MES, S2/KIM, S2/ENE, S2/ITM, S2/INF, S2/LIN, S2/PRO, S2/PSR, S1/IND, D.III/MAN, D.III/INF. GPA ≥ 2.75 : S1/ELE, S1/ALE, D.III/ELE, D.III/ALE. All documents must be submitted into the yellow folder and please write your name, position code, ID Card Number, contact numbers (cell phone), and email address on the cover of the folder. For example : BAGUS WIJAYA, S1/ELE , 337411xxxxx , 081703903xxx, bagus@email.com. JobsCDC.com now available on android device. Download now on Google Play here. Please be aware of recruitment fraud. The entire stage of this selection process is free of charge. PT PLN (Persero) - D3, D4, S1, S2 Fresh Graduate Career Expo Program PLN July 2016 will never ask for fees or upfront payments for any purposes during the recruitment process such as transportation and accommodation.